Soil salinity is one of the key abiotic stress factor affecting agricultural productivity worldwide. Every day, nearly 2000 hectares of fertile agricultural land degrades due to salinity. There are only limited agricultural options to cope with increasing salinification of soils, especially in the case of salt sensitive staple crops such as rice and wheat, productivity of which is seriously curbed due to salinity in many Earth locations. Among the possible options, plant growth-promoting bacteria (PGPB) have a large potential to improve crop plant productivity under salinity, but the progress in application of PGPB has been slow due to lack of non-invasive methodology for testing the efficiency of different bacteria in increasing plant salt resistance. The present collaborative study by scientists of Chungbuk National University, South Korea and the Estonian University of Life Sciences looked at foliage volatile emission and photosynthetic traits as potential non-invasive markers to estimate improvements in salinity resistance upon inoculation of rice plants with plant growth-promoting rhizosphere bacterium (PGPR) Brevibacterium linens RS16. of stress as well as induction of various primary and secondary metabolic pathways through progression of stress," said Professor Ülo Niinemets of Estonian University of Life Science. In the present study, we used IR29 (salt-sensitive) and FL478 (moderately salt resistant) rice cultivars, to assess foliage carbon assimilation and stress volatile emission rates in response to inoculation by the halotolerant PGPB B. linens RS16 followed by the application of salt in soil. 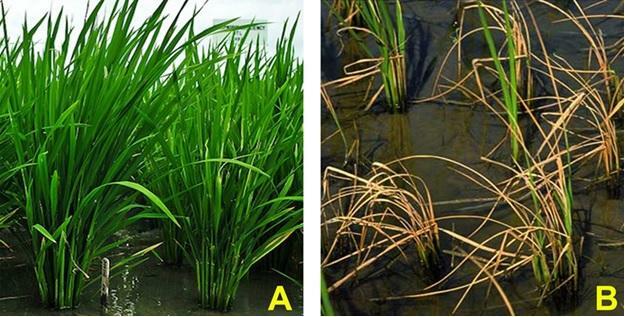 Inoculation of rice plants with B. linens RS16 alleviated the severity of salt-stress, characterized by enhanced foliage photosynthetic traits and decreased stress volatile emissions. Greater changes detected for salt-sensitive cultivar IR29 than for moderately salt resistant genotype FL478. Results showed that salt stress negatively affected foliage photosynthetic characteristics in both rice cultivars. Moreover, salinity enhanced the emission rates of foliage stress volatiles. However, B. linens RS16 inoculation significantly improved photosynthetic characteristics and reduced the volatile emission in salt stressed rice cultivars, compared to control plants. The cooperation among the participating teams was supported by a collaboration with the framework of European Research Council (ERC) – Korean National Science Foundation collaborative agreements allowing the Estonian partner team led by Prof. Ülo Niinemets working in the field of plant stress biology and volatile emissions to team up with the Korean microbiology team led by Prof. Tong Min Sa.